This course is for High School students and recent High School graduates. 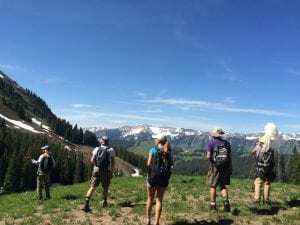 This course is offered as a partnership between the Gunnison School District and the Rocky Mountain Biological Laboratory. Instructor: Ann Colbert, in collaboration with Dr. Jill Anderson and other RMBL scientists. Length of time: 2 weeks, Mon-Fri at least 9-5:00 with 2-3 evening sessions. One optional weekend day. On-site housing is not available. Students must make their own arrangements to live off-site. Course Description: The goal of this course is to teach the process of conducting biological research in the natural world. Course activities include making natural history observations, asking research questions, and working with scientists on topics as diverse as plant biology, pollination, stream ecology, and animal behavior. Students will work individually or in small groups to conduct their own research projects under the guidance of instructors. Students will have access to modern scientific equipment, including a Li-Cor 6400 that measures photosynthesis and respiration, GEOXT GPS units and GIS software, drying ovens, microbalances, and a microscope/camera set-up. Pre-Requisites: One year of HS biology, except by permission of the instructor. High School Credit: We expect that students will be able to earn 1/2 year (one semester) science credit in the Gunnison Watershed School District. For credit to be earned, participant must attend all class times. College Credit: Students can register for up to two credits of college biology through Western State Colorado University. There is a small additional fee in order to receive college credit. Students must fill out this paperwork BEFORE the start of the class, in order to receive college credit. Contact youthscience@rmbl.org for details. Cost: $1,500 for students outside of the Gunnison District. Local Crested Butte, Gunnison, and Lake City students pay $1,340, if they register by March 15. Scholarships are available for Gunnison district students – see below. After March 15, Crested Butte or Gunnison students can register for $1,500. For all students, a $500 Deposit is required to hold a spot. The balance of the fee is due by June 1. The class typically fills by May. Scholarships: Students from the Gunnison District may apply for a scholarship. Scholarships will pay part or all of the $1,340 fee. To apply for a scholarship, please send the following application materials to the youth programs manager by email (youthscience@rmbl.org). The deadline for applying for a scholarship is March 1, 2019. Students receiving a scholarship must still submit a deposit, which will be returned when the class is completed and expectations are met. Students who do not satisfactorily complete the course forfeit the deposit. Class size: 13 students, including approximately 6-7 students from the Crested Butte or Gunnison Schools. Students may register below on a first come, first served basis. Register HERE for the 2019 High School Course. Acceptance: Once you have been accepted into the class, please submit the following three forms to the youth programs manager by June 1, along with the balance of the course fee. Liability Waiver for the student. Travel form and Photo release. Contact: Please direct questions regarding the high school course to Ann Colbert, RMBL Youth Programs Manager, youthscience@rmbl.org.